Amusement parks can be fun until you get on the WRONG ride! I was so anxious to get on the ride that at first, my infinite inpatience was beginning to get the better of me, as I slowly loomed ahead to the front of the line, anxiously awaiting for my turn to board. I was going to ride alone in one car so nobody, not even those who rode with me, would bare witness to what was going to take place. As I finally took my seat, the wheel started to move slowly and I was able to gaze down below, looking at the amazing view: all those people seemed so small from up here, some rushing, while others were simply going about their business: some boarding rides, others eating, the screams heard from the roller coaster off into the distance and the loud, jovial carnival music playing below. It was so peaceful up here, so tranquil, and very relaxed...nothing could touch me up here. I had to get back to my own time line, but how? 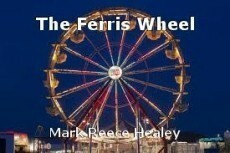 The only way was to get back on that Ferris Wheel! And so I did....and here I am now, telling you my story about that fateful day. I never told you if I ever returned? And if I didn't return, you can readily assume that I am now telling you this story from a time line that is unbeknownst to...YOU! © Copyright 2019 Mark Reece Healey. All rights reserved. Whoa! An amusement ride to the future. Reading that really brought home how much things have changed. An excellent read as always, Mark. An entertaining story, Mark. The first three paragraphs could have been part of a true story. Or maybe the whole story is true?? Imagination is such a wonderful thing. Thank you. You raise some good points. No imagination comes without some truth in mind. I'd like to think my stories are somewhat enigmatic. One of the best things about Flash Fiction is being able to wrote a story that can evolve into another story or to simply leave the reader to form his or her own interpretation. I love the way you write. This is the essence of what makes a short story work. emmersive yet to the point while still being able to go places you did not think you would go when you first started reading. Thanks - I aim to please. Believe it or not, the stories that are currently posted on my profile are not my best work! I have " hidden" the others as they have been recently compiled into an Ebook. The first and self titled story, ' C'est La Vie" has been posted as an audio clip on You Tube. Check it out! Thanks again for your kind words...and for being a fan. I will now take some time to read your work! Standing in the Rain; a brief portrait of a victim.